I've never quite understood the concept of revenge, but it sure makes for some good plots... and here's one. 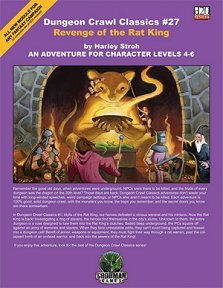 It's particularly good if you have played Idylls of the Rat King earlier in your campaign, but if you haven't it is either a case of mistaken identity or just a set-up to catch generic adventurers. Slavers have to get their merchantise somewhere, after all. After the usual plot summary, list of wandering monsters and scaling information, there are a series of hooks to get the party interested in what is going on. They all revolve around an innkeeper called Gotlieb. It may be that the party has been tasked with finding a bunch of slavers, or someone they care about has been abducted by them - or they might even find themselves rescuing Gotlieb from a lynch mob who are certain he's in on the slave trade... This has all been orchestrated by the Rat King, especially if you are going for the default revenge angle. The adventure falls into three parts. The first bit is a standard dungeon-crawl through the sewers. Then they get captured. This is a given, by the way. Eventually they should win free, get hold of weapons and equipment, and be in a position to deal with the Rat King once and for all. It's an adventure for the thinking character, however, those who like to rush bull-headed into combat will likely end up in difficulties. As usual with the DCC line, the adventure begins as Gotlieb opens a door in the basement of his inn giving the party access to the sewers below. How you get them to this point is up to you. Run with the ideas given or come up with something of your own. Once down there it's a good if fairly standard delve, with opponents whose conversational heights run to "I'm going to kill you!" and similar taunts, and a few traps to figure out along the way. The novel central phase ensues, with the party waking up in a dark cell, without their possessions. The cell is held to be escape-proof. Can our heroes prove this assumption wrong? If they are inventive and careful, they ought to be able to win free and return to deal with the Rat King for good and all in a thrilling climax. Return to Revenge of the Rat King page.